The SVG3 Digital Micron Vacuum Gauge is a compact, rugged gauge that is loaded with features HVACR professionals need to help them do more. 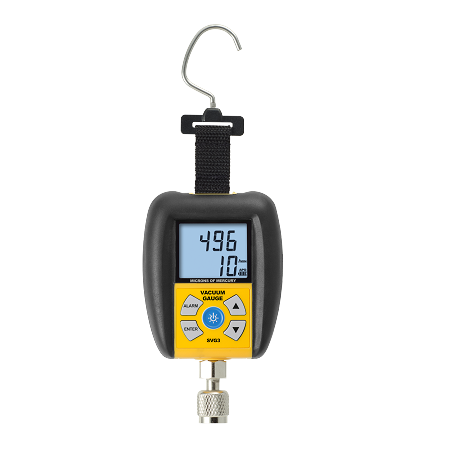 It includes a large, dual display with a rate indicator, alarms, timer, rugged rubberized case, and a hook at strap that allows the vacuum gauge to be hung at any angle. Auto power off: after 15 minutes of readings more than 10,000 microns if APO is active. Battery life: 40 hours standard use (alkaline) without backlight use. 148 TruReward$ points will be placed in your account when you buy this item.